A family member that had previously been kept private for The Family. Known also as El Nino (Bio Cup 98 HTCC) but it is better as a female therefore the name change to La Ni�a. It manifests characteristics that are predictable, contrary to her previous name implies. She has a genetic composition of Haze x Widow, making her an inevitable candidate for a hot love story with her consumer. Those who grow La Ni�a will be in for a happy end product and a delightful growing experience...so let the seed take you on a journey.! Expected yield: indoor 450-550 g/m2 g/h & outdoor g/plant dependent on climate. 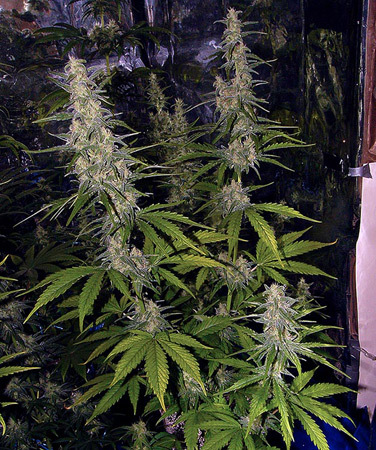 Flowering period: Indoor expect it to be ready 56-70 days. In the North/hemisphere it will be ready by October and in the South/hemisphere it will be complete by April. Recommendations: For the inexperienced growers to the most advanced cultivator. Special Notes: A winner of the HTCC in 98, know also as El Ni�o. Also a very hardy and reasonable practical hybrid. Click here to visit "La Ni�a" forum!